I may not be one to go for exotic Kbeauty ingredient such as snail filtrate and snake venom, but oriental herbs are definitely something that catches my eye. 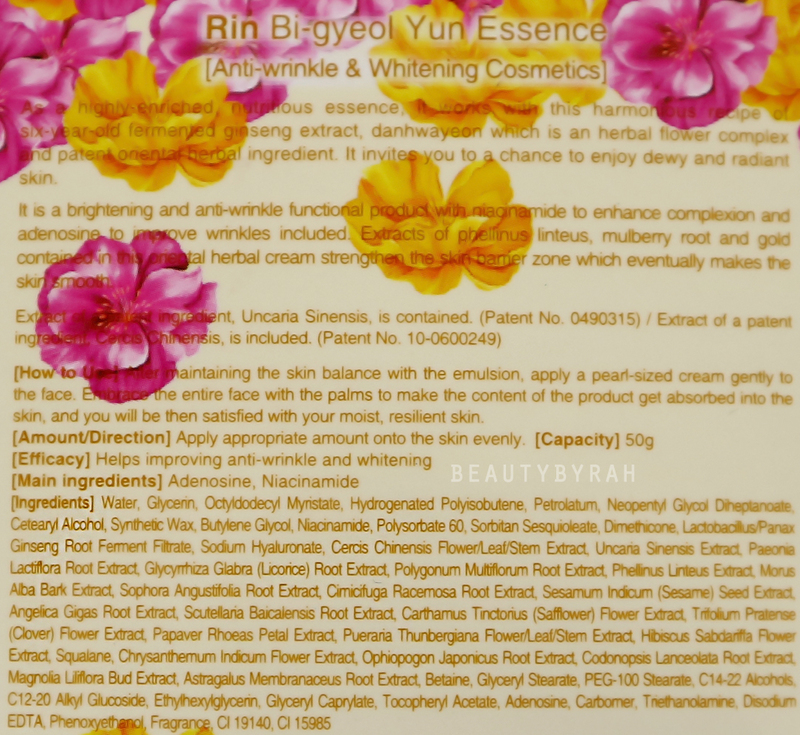 Hansaeng Cosmetics RIN Bi-gyeol Yun Cream is a oriental skin care product that contains 6 year fermented ginseng and 15 oriental medicine extracts. 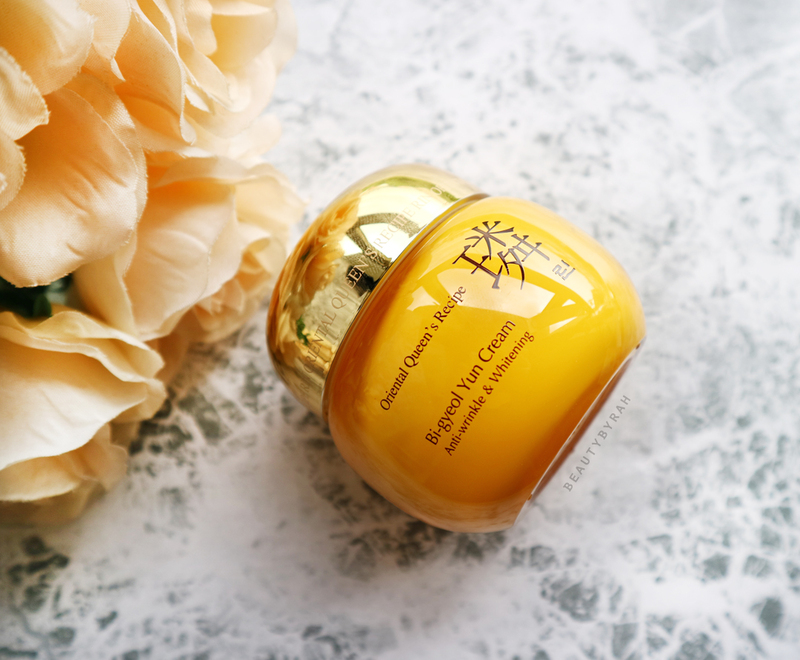 This cream is said to help us obtain a smooth and refined skin tone. This whitening and anti-wrinkle cream contain niacinamide to help achieve a brighter skin tone and adenosine to help in refining wrinkles. This cream comes in a jar (not the biggest fan of jar packaging as you may know) and despite the plastic packaging, it does look luxurious and classy. There is a good weight to it and it feels sturdy. I like that the product is encased in a opaque jar as this reduces the amount of light exposure that can break down beneficial ingredients, rendering them useless. The jar packaging, however, enables exposure to air and germs which helps fasten the rate in which beneficial ingredients degrade as well. 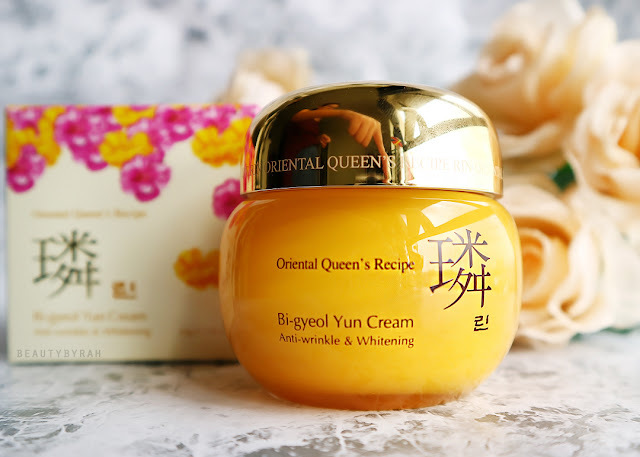 The cream leans towards a thicker consistency due to high concentrations of Octyldodecyl Myristate , Hydrogenated Polyisobutene and Petrolatum. When applied to the skin, it does blends readily the moment it gets warmed up. Despite the cream feeling pretty thick when first applied, I realised that it evolves into a gel like texture when blending into the skin. It does not feel very heavy on the skin and breathable! 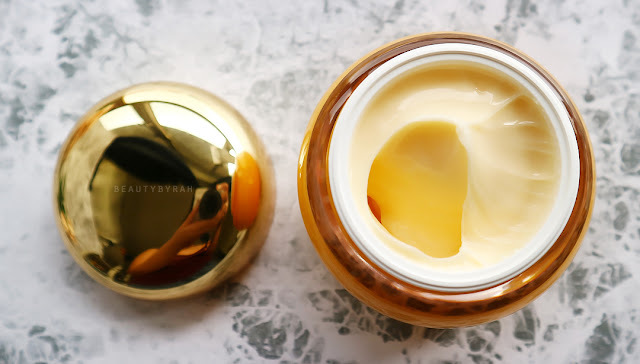 As my skin is pretty dehydrated (and it does not help that I am testing out the Stridex Pads with salicylic acid which dries the skin up as well), I do find that this cream really does help supply the required hydration to my skin. My skin does not feel tight throughout the day and the dry patches haves subsided. I also noticed that my makeup goes atop this cream nicely as well. 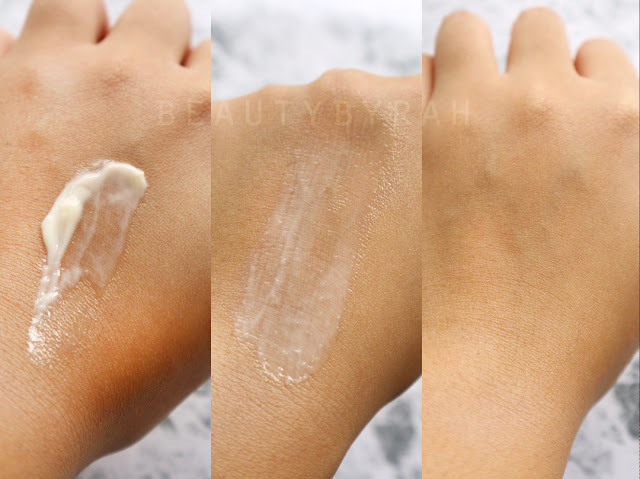 Some moisturisers can result in the foundation application ending up streaky due to the incompatibility of ingredients (e.g. water and oil). A little goes a long way and I realised that if I slather this on (which I did at the beginning), the cream is too rich for my skin and I had quite a few small bumps around my cheek area. I usually use about a dollop roughly the size of a 10 cent coin and it is sufficient for my face and neck. One thing I have to say is that I am not a big fan of the scent of this cream. 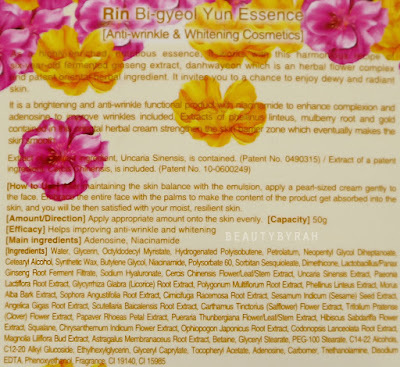 Despite fragrance being the third last ingredient, the scent is pretty strong and I am not sure if the oriental ingredients contribute to this. For those with extremely sensitive skin, this could possibly be a source of skin irritation. After using this for about 3 weeks now, I can say that my skin definitely is more hydrated and supple though I am unable to really attest to the refining of wrinkles. I think this cream would be great for those with dry or dehydrated skin as it really does provide a boost of moisture. It can be a tad heavy for those with oily skin. Also, using only a small amount of cream during application is key. When searched online, this retails for USD 40.95 on Kmall24, if you're interested. **This cream was provided by BNT News for a review. Only honest thoughts are shared here, with no influence from others. I am not compensated nor affliated to the brand.